An unaltered photocopy of your DD-214, OR WD AGO 53-55, OR other military issued document displaying your completion of Bacic Training, or your assignment of a Military Occupation Specialty, or four months active service. 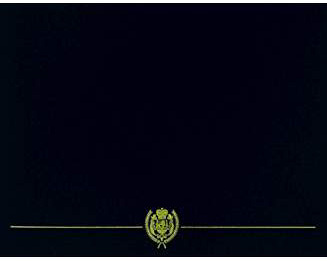 The Army Service Ribbon was established on April 10, 1981, by Secretary of the Army John O. Marsh, Jr. The Army Service Ribbon has been in effect since August 1, 1981 but may be awarded retroactively to those personnel who completed the required training before August 1, 1981 provided they had an active Army status as defined above, on or after August 1, 1981. Only one award is authorized. The Army Service Ribbon is awarded to members of the Regular Army, National Guard, or Army Reserve for successful completion of initial entry training. In the case of personnel who receive a Military Occupational Specialty identifier based on civilian or other-service acquired skills, the ribbon is awarded upon honorable completion of four months active service. Only one award of this ribbon is authorized, even if an individual completes both officer and enlisted initial entry training. The Army Service Ribbon is worn after the NCO Professional Development Ribbon and before the Overseas Service Ribbon. The Army Service Ribbon may not be worn on the Navy, Marine Corps or Coast Guard uniforms. No devices have been authorized for the Army Service Ribbon. 1. Description: The ribbon is 1 3/8 inches in width. It is composed of the following vertical stripes: 7/32 inch scarlet 67111, 5/32 orange 67110, 3/32 inch golden yellow 67104, 1/8 inch emerald 67128, ultramarine blue 67118, 1/8 inch emerald, 3/32 inch golden yellow, 5/32 inch orange, and 7/32 inch scarlet. 2. Components: Ribbon. MIL-D-11589/281. (There is no medal for this ribbon). 3. Criteria: a. 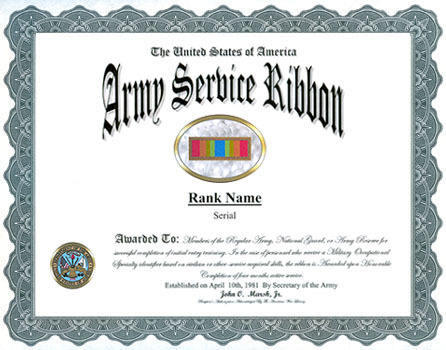 The Army Service Ribbon is awarded to members of the Army, Army Reserve and Army National Guard for successful completion of initial-entry training. b. The Army Service Ribbon may be awarded retroactively to those personnel who completed the required training before August 1, 1981 provided they had an active Army status as defined above, on or after August 1, 1981. Only one award is authorized. c. Officers will be awarded this ribbon upon successful completion of their basic/orientation or higher level course. Enlisted soldiers will be awarded the ribbon upon successful completion of their initial MOS producing course. Officer or Enlisted personnel assigned to a specialty, special skill identifier, or MOS based on civilian or other service acquired skills, will be awarded the ribbon upon honorable completion of four months active service. 4. Background: a. The Army Service ribbon was established on April 10, 1981, by the Secretary of the Army. b. The Army Service ribbon is multi-colored to represent the entire spectrum of military specialties in which officers and enlisted soldiers may enter upon completion of their initial training.